Dirty Girl gaiters, New Balance Minimus trail runners, and wool leggings. 1 GoLite Pinnacle backpack, size M. This was a spur-of-the-moment purchase, with absolutely no pre-planning or knowledge involved. My sister picked me up at the Denver airport about 5 years ago and said “GoLite is having their annual sale! Let’s go!” So before doing anything else, we went there, wandered around, and before I knew it I was the proud owner of a new backpack, replacing my external frame Sierra Designs, ca. 1966. 2 pair of New Balance men’s Minimus 10v2 trail runners. I LOVE these shoes! They are very light-weight, fairly rugged, and I was able to go the entire 220+ miles with not one foot problem. No blisters, no swollen or sprained ankles, no nothing bad. 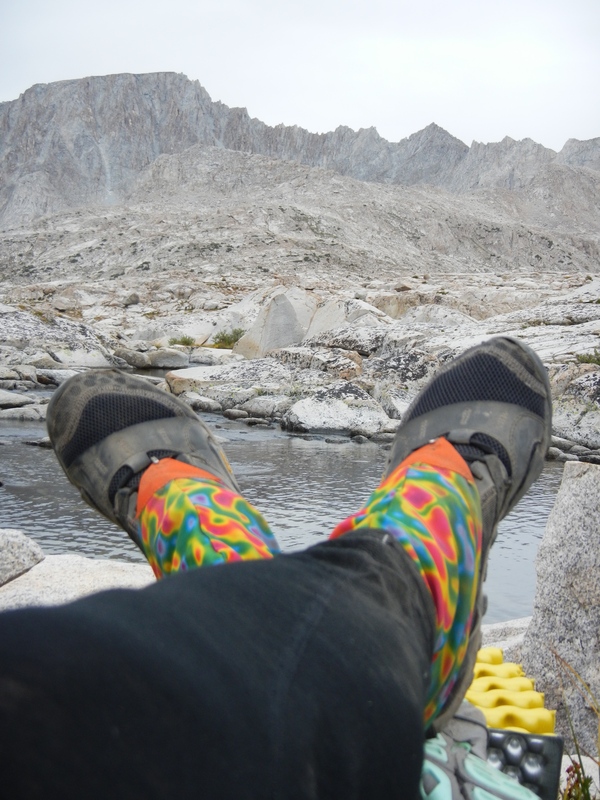 Over my long life of walking, I have had my share of sprained ankles, and I eventually came to realize that they only happened in the aftermath of wearing hiking boots with ankle support. Hike for a few miles, take off you boots, sprain your ankle. So I figured out eventually that it was the ankle support that was the problem. Now that I hike/walk without support, my ankles don’t rely on it. After about 3/4 of the trail, I brought in a new pair of shoes (I had them in the resupply package, just in case), as I felt that the old ones just weren’t gripping the granite like they used to. Brand-new shoes, never been worn, and no break-in period. I was also very concerned about my Morton’s neuroma acting up, which is extremely painful and would have ended the trip for me, had it recurred. I am very happy to report no problems there, either. 1 Kühl hiking shirt. I really like this shirt, except that it had a hole in one of the two zippered pockets, which caused me to lose my very sweet customized Swiss Army knife. But it breathes well, and dries quickly. 1 pair REI pants with zippered legs. I began to regret having to carry the bottom legs, as I only used them once on the trail. I like these pants lots and have had them for a few years now. Unfortunately, the zipper started to irritate my calf and by the last 1/4 of the trip, I had jettisoned them in favor of my skirt. 1 Prana cotton jersey skirt, bought on sale years ago in Stanley, ID, at the beginning of a river trip. This skirt was a big hit with women on the JMT. Very comfy. Length is just below the knees, so you save on sunscreen application. But it doesn’t dry quickly, and weighs more than synthetic materials would. But oh, so comfortable! 1 pair Mangrove Sun Gloves. These things, bought on the way up to Yosemite at a big sporting goods emporium in the Central Valley, were fantastic! They kept my hands from being chafed by the trekking poles, and I never had to worry about putting slippery, icky sunscreen on my hands. Plus, they kept my hands just a little bit cleaner than they might have gotten otherwise. I saw people hiking with heavy gloves on their hands, or trying to protect them with bandannas tucked in the ends of their sleeves. This solution was ever-so-much better! 1 pair Black Diamond trekking poles. 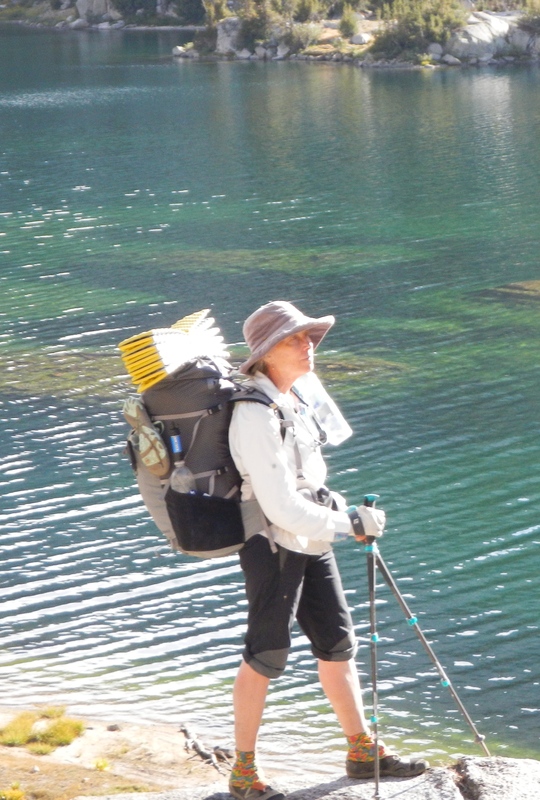 I found hiking with poles to be invaluable. They kept me from a few falls, I’m sure, and also give the upper body a nice workout along with the legs. There are lighter poles, but these worked just fine for me. When I hefted Betty’s lighter poles, I was at first jealous, but then figured that my poles gave me a slight work-out advantage, just by having to move that much more weight with the arms. Everything is a trade-off in some way or another. In the interest of full disclosure, I will admit that one time, when a pole got stuck in the rocks, it caused me to lose my balance and fall on a very pointed rock. I had a really handsome purple bruise on one of my glutei to show for that. 3 pair of socks. I liked the Wright Socks quite a bit, but they had a hole in them by the end of the trip. The heavier SmartWool socks were very comfortable, and wore like iron, but didn’t dry quickly enough. The REI wool blend socks were OK, but didn’t seem to fit as well as either of the other brands. 1 cotton sun hat, 1 wool cap with earflaps. 1 titanium spork, 1 titanium mug, both Snow Peak brand. 1 little Buck knife with a snap-in plastic scabbard, very sharp and useful for opening packages and spreading almond butter on crackers. DW Moment Tarptent, Black Diamond trekking poles. 1 DW Moment Tarptent. 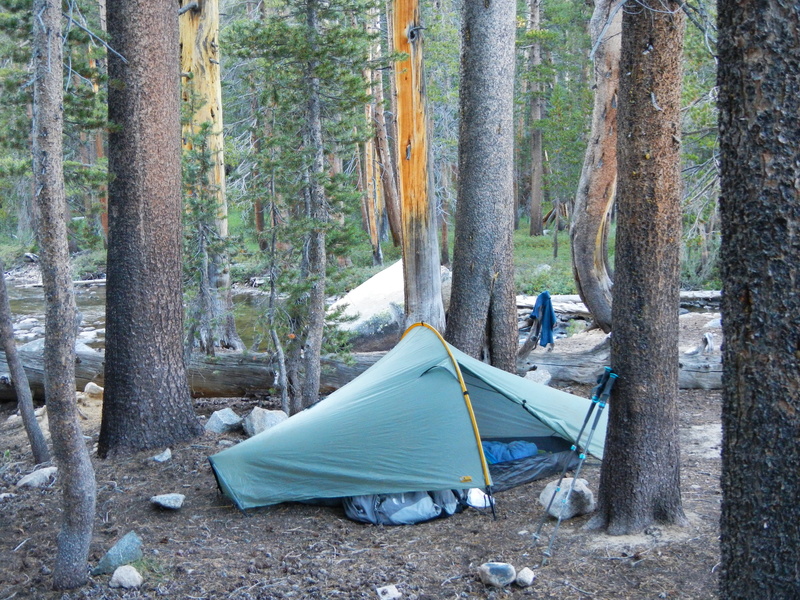 This is a great one-person tent, designed and made in Nevada City, CA. It sets up in a flash, with one tent pole and two stakes. Doesn’t need a ground cloth, apparently. I bought mine directly from Henry Shires, the designer, when I was in Nevada City for the Fathers’ Day Bluegrass Festival this last June. It had a tiny, repaired defect, so I got a little discount and of course saved on shipping. 1 pair Dirty Girl gaiters. They were very handy for helping to keep little rocks and dirt out of my shoes. Both Betty and I had Velcro-sticking trouble with them at various times, but that wasn’t insurmountable. 1 set of light silk long underwear for sleeping. Very comfy. 1 Thermarest Z-Lite waffle pad, 1 Thermarest small ProLite self-inflating pad. It didn’t really self-inflate at those altitudes, but it didn’t take much to blow it up, either. The combination was very, very comfortable (ProLite on top of the Z-Lite) and kept me well-insulated from the cold ground. I could sleep on a granite slab in complete comfort with this combo. 1 (sometimes 2) fuel canisters for the stove. 2 Reflectix cozys (homemade by Betty), for freezer-bag cooking. 1 small paperback copy of John Muir’s “The Mountains of California.” It felt very strange to tear out pages when I was done reading them, and burning them. I have never burned a book before, but weight is weight. 1 Sawyer Mini-Squeeze water filter, and 2 1-liter-size plastic water bottles (one for clean water and the other for “dirty,” aka unfiltered, water). For most of the trip, I carried a small pair of binoculars on my belt. They were nice to have on occasion, but when we got to Rae Lakes, I sent them off-trail with Betty, deeming them an unessential extra weight. I didn’t miss them for the rest of the trip. Usually, I carried a set of Tom Harrison JMT maps and a copy of “John Muir Trail: The Essential Guide” (Elizabeth Wenk, 5th ed). Every item was used repeatedly and was more-or-less essential to our comfort and well-being on the trail, except for the compass (which I never used) and the rain gear (it never rained). I really didn’t find myself missing anything that I didn’t have with me, except for a guitar or a fiddle occasionally. Thanks for writing the bonus blog entry — it softens the blow of the impending ending! I had no idea I was so interested in the details of backpacking supplies (maybe because I’m not a banjo player) until I read your account, which I found quite fascinating. Backpacking equipment has changed a lot since the mid-1970s when I was sewing Frostline kit down booties and jackets for my brother and father. I recognized the Dirty Girl gators, but wondering what your rain gear was. Enjoyed the journey. Ah, yes, I forgot to say what it was. I almost never even looked at it. Pants: Extrasport X-treme splash pants. I bought these on eBay, and then modified them by cutting off the cuffs and most of the large waistband. They won’t be any good for kayaking anymore, but I never did that anyway. They are comfortable and waterproof for rain, if it ever comes again. Jacket: North Face Goretex lightweight rain jacket. Can’t remember the style name. Since I never wore it, and got it from REI, I am considering returning it. I sure have enjoyed reading of your trip. I can relate to your description of running off the road when you again started driving. After a month of not driving, I got into my car, backed out of our driveway, and plowed right into a car parallel-parked across the street. Mike and our neighbor were standing there talking and witnessed my re-entry into civilization. I have volunteered to be on the Calaveras Cty. Search and Rescue (SAR) team and need to get a new light, at least 2500 cu in., backpack (We carry a lot of wt., i.e. at least 20 lbs for just the 24-hour pack). I saw your mention of the type you and I’ve gone online to investigate the Golite pinnacle (not easy to find so far). Do you have any feedback as to what you wished your pack had or didn’t have, esp. with the straps system? I have a fairly new pack but it just isn’t comfortable on my back or buckled across above my chest (just what I needed – to feature that rather prominent part of me. HA). I’d appreciate any feedback you have re. packs and your effort/time.